Cloudy during the evening. A few showers developing late. Low 41F. Winds NNE at 5 to 10 mph. Chance of rain 30%. John Smallwood, right, of Billings, chats with Billings police officers Monday as they ride by on their Segways. Downtown patrol officer Harley Cagle said the Segways have been getting a lot of attention. Downtown patrol officer Harley Cagle uses a new Segway to direct traffic in downtown Billings on Monday. 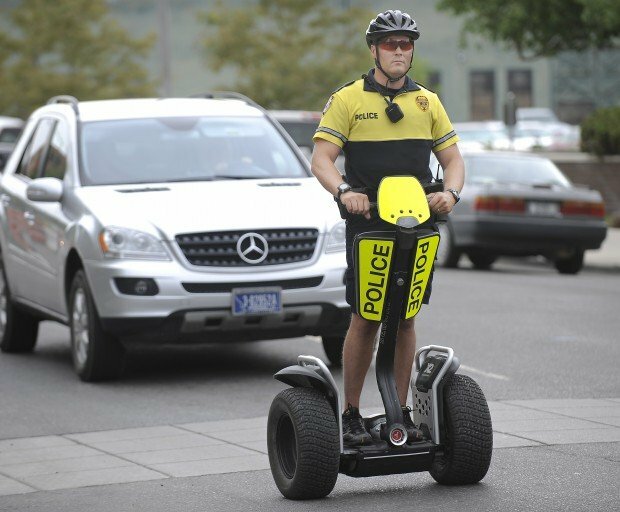 ﻿For what it’s worth, Billings Police Chief Rich St. John said, his officers are enjoying their trial runs on a couple of Segway stand-up scooters. “One overwhelming comment I’ve heard from those who use them is that they’re fun,” he said. But that isn’t going to be one of the factors he’ll take into consideration when it’s time to decide whether the department actually wants to buy one or more of the two-wheeled, battery-powered vehicles. “It’s just a tool, and that’s what we’re trying to assess: is it feasible, is it practical?” St. John said. 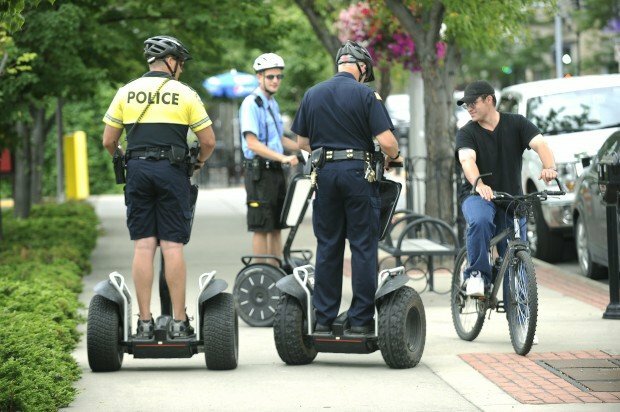 Segway brought the “personal transporters” to Billings as part of its “Patrolling Across America” campaign to introduce the vehicles to police departments and other agencies. After training some police officers and others, St. John said, the company left two Segways with his department, one with the city’s parking enforcement division and two with the campus police at Montana State University Billings. The department’s Segways are being used by the two downtown officers who normally ride bicycles. St. John said the Segways have generated a lot of interest downtown and led to many conversations with residents — and have also drawn a few disparaging comments. St. John said the $8,000 Segways, which have a top speed of 12.5 mph, would have to prove to be more efficient and practical than bicycles, which have been a useful tool for the department. There are questions about how well the Segways would work in the winter, and St. John said he doesn’t know what rules of the road apply to the vehicles. From what he’s seen, St. John said, the Segways seem best suited for indoor security at large airports. How well they’d work on the streets or sidewalks of Billings is what the department is trying to determine. “The bottom line for me is, it has to be practical,” he said. Contact Ed Kemmick at ekemmick@billingsgazette.com or 657-1293.